Forexcharts does not recommend Nadex. To see our recommended brokers click here. Founded in 2004 and originally known as Hedgestreet, Nadex is now based in Chicago, Illinois after moving from its former location in San Mateo, California. The company started out as an electronic marketplace offering trading in financial derivatives to smaller retail investors, and it was the first Internet based exchange that offered trading in event futures and derivatives. Hedgestreet offered traders a place where they could hedge against and speculate both on the price movements of different assets and the release of economic events. Hedgestreet Exchange shut down its operations in 2007 and was purchased by UK based IG Group Holdings for $6 million. IG Group is a public company traded on the London Stock Exchange (LON: IGG) that specializes in financial spread betting and CFD trading. Hedgestreet was rebranded in 2009 as the North American Derivatives Exchange or Nadex, which became the United States binary option trading arm of IG Group Holdings. The company is currently regulated by the U.S. Commodities Futures Trading Commission or CFTC. While the firm was originally largely an online binary options exchange, Nadex today offers its customers trading opportunities in binary options and spreads on forex, stock indexes and commodities, as well as economic event trading. Nadex currently does accept U.S. based customers, so it is a good choice for such traders. Nadex offers its clients a large selection of markets that traders can establish positions in to take advantage of short-term price moves. Nadex customers can choose from among 5,000 hourly, daily and weekly contracts that trade six days a week, 23 hours a day. The company offers both web-based and mobile platform applications that give traders the opportunity to trade stock indexes, commodities, forex and economic events, all from just one account. This can be extremely advantageous to a trader who is interested in watching and making transactions in several markets. Another excellent feature of Nadex is that instead of trading the reaction to an economic event, such as taking a position in a currency or commodity that will react to the news, Nadex lets you trade the economic event itself. This means traders do not have the added uncertainty of having to predict the actual market reaction and timing. Events that trade actively on Nadex include the Fed Funds Rate Decision, U.S. Non-Farm Payrolls and U.S. Weekly Initial Jobless Claims. Instead of making their money from the dealing spread like most online brokers, Nadex charges trading fees on both opening and closing transactions. Fees are $1 per contract per side and are capped at $50 for one to fifty contracts, with no additional fees charged for 51 contracts and higher. Furthermore, when it comes to option contracts, if at settlement the option is in the money, then a $1 fee is charged per contract with no fifty contract limit; but if the option is out of the money, then no fee is charged. Individual Account (U.S.) – this type of account is specifically for United States residents. An Individual U.S. account does not need to be funded and can be opened by anyone providing a permanent US residential address, a birth date and a Social Security number or other visa information. Business Account – this type of account is designed for LLCs, Trusts, Partnerships and Corporations based in the United States. To open a Business Account, documentation verifying its ownership and authorization to engage in the type of trading offered by Nadex is required. Other necessary documentation for this account type includes a W-9 Form, a Nadex Entity Membership Agreement, a Unanimous Consent Resolution, and valid government identification for each of the signatories on the account application. Additional documentation is required depending on whether the account is for a Trust, an LLC or Partnership, and a Corporation. Permanent Demo Account – at Nadex, you can open a free unlimited time demo account. The account comes with $25,000 of virtual funds and gives the trader the opportunity to learn how to use the Nadex trading platform and test out different trading strategies without committing any funds. U.S residents can deposit funds to their account through a debit card, an ACH bank transfer, a Wire Transfer or with a paper check. Non-U.S. residents can make a deposit from their checking account, a debit card, or an international bank wire transfer. U.S. residents can withdraw funds using an ACH bank transfer, a wire transfer or a debit card. International clients can withdraw funds through an international bank transfer or to a debit card. A wire withdrawal costs $25, with no charge for account setup, electronic check setup or deposit, or electronic withdrawals. Nadex’s web-based trading platform works seamlessly with its mobile app, allowing traders to open and close positions interchangeably between the two. The web-based platform requires no software to be downloaded and features the company’s unique price ladder charts. The ladder charts allow you to select your market, analyze the chart, and then place the order directly from the chart — all from one screen. This powerful trading platform runs on any modern personal computer with an up to date browser and a reasonably fast Internet connection. Nadex’s trading platform is designed specifically for touch screens and is compatible with Windows, Mac or Linux operating systems. In addition, the company offers full-featured mobile apps for iPhone, iPad and Android. The mobile app comes complete with charting and technical indicators. 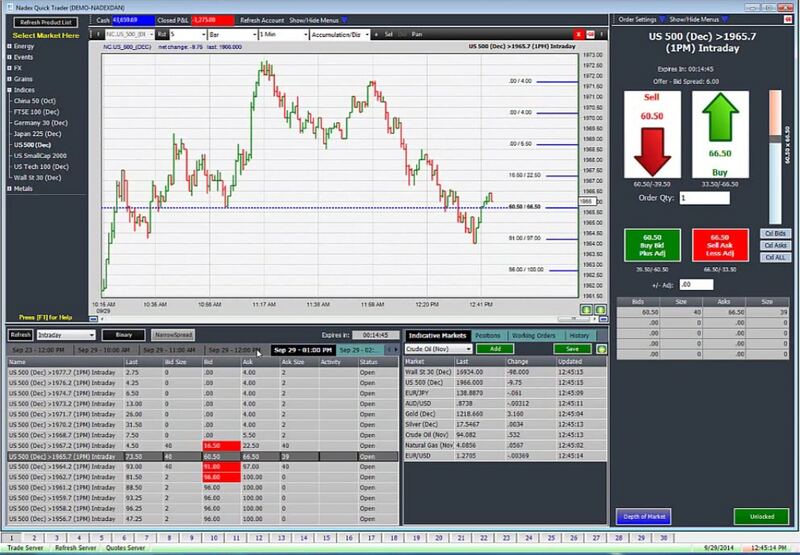 The image below is a screenshot of Nadex’s trading platform, which shows binary options expirations for the S&P 500 contracts, a chart of the index and the order entry section on the right. Nadex customer support is available from 11:00 AM EST on Sunday through 5:00 PM EST Friday. The company has a toll-free U.S. number, while International callers must dial direct. Email support is also available from Sunday through Friday. Educational – Nadex offers educational courses in Binary Options, Nadex Trading Strategies and Nadex Spreads. The company’s Learning Center also offers two webinars a week, access to its webinar archives, videos, handbooks, a trading glossary, and trade examples. Regulatory Compliance – The company is registered with the United States Commodities Futures Trading Commission or CFTC, which is the U.S. government agency that oversees futures, options and swap trading. Nadex has been designated by the CFTC as a Designated Contract Market and Derivatives Clearing Organization and is one of the few online brokers that can accept clients based in the United States. Because of its CFTC designation as a registered Exchange and Clearing House, the company only matches buyers and seller and does not itself participate in trading or market making so the issue of a broker trading against their client does not arise with this firm. In addition, all Nadex member funds are held in segregated accounts at top-tier U.S. banks, which helps ensure their safety. Nadex would not be a good choice for a trader that wants to use MetaTrader4 or who wishes to make deposits and withdrawals via an electronic payment service like PayPal, since neither are supported. Also, trading fees are involved in both opening and closing trades. Still, Nadex gives small retail traders based in the United States the opportunity to trade binary options, spreads and event contracts on a variety of assets that would normally be out of their reach. Furthermore, the company takes interest in their clients’ education, with ongoing webinars and a Learning Center packed with valuable trader resources.